MOROCCO: Siemens Gamesa Renewable Energy (SGRE) officially opened its new blade manufacturing plant in Tangier, northern Morocco, in mid-October. It is the first such facility in Africa or the Middle East. 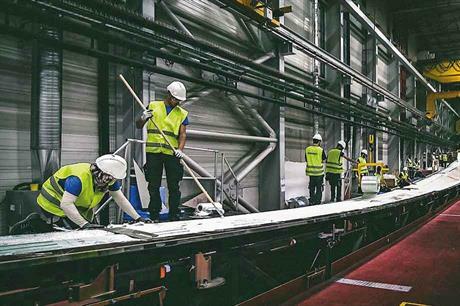 The 37,500m2 plant, which started pilot production in April, will make 63-metre composite blades for local projects and export to Europe, the Middle East and other African countries. Other blade types — up to 75 metres in length — could be added to the factory's output in the future and the plant will create 600 local, full-time jobs. "This project is good for our company and a solid business decision," said SGRE chief executive Markus Tacke. "We invest where we see strong business opportunities, and the opportunities here in Morocco are stronger than ever before," he said. The country is aiming to generate 52% of its electricity from clean energy sources by 2030, with wind providing 20% of the total. SGRE claims it has roughly 70% of Morocco's 787MW installed wind market, with more to come following its success with partners Enel and local firm Nareva in an 850MW tender in March 2016. At the opening ceremony in Tangier, SGRE's new onshore CEO Ricardo Chocarro, said the port city was a perfect location for a new facility. "We have leverage on a lot of suppliers. We already source towers from here, some other construction services and logistics. Much of the supply chain is already here, but if the demand is local the supply chain will grow further," he said. "Our global footprint needs to be dynamic. We need to be close to where the demand is. We need to be conscious of being cost effective," Chocarro said. "But, we cannot depend only on Morocco demand. We chose Tangier because of the superb logistical position. Tangier is very close to a very important harbour, so the idea is to not only supply to Morocco, but through the harbour we can send our blades from this factory to the rest of Africa, and even to southern Europe." The factory is in Tangier's Automotive City, a free-trade zone that removes customs regulations and other taxes. There are around 13 of these zones in Morocco.